In aromatherapy, an organic product with a generous amount of Eucalyptus essential oil helps to clear the mind and focus concentration, while reducing swelling in the mucus membranes. It is very valuable in fighting respiratory problems, fighting inflammation and sore muscles, rheumatism, headaches and nervous exhaustion, while boosting wound and ulcer healing and soothing skin eruptions. Eucalyptus essential oil has a clear, sharp, fresh and very distinctive smell, is pale yellow in color and watery in viscosity. The 'eu' and 'kalypto' means 'well' and 'covered' in Greek, referring to the cup-like membrane that covers the flower bud, which is thrown off as the flower expands. The Australian Aborigines calls it 'kino' and they use the leaves to cover serious wounds. The tree uses a lot of water while growing and has been used to clear water-logged land, draining the water from swamps where malaria mosquito may be found. The tree was thought to prevent malaria in the past, due to this draining action. 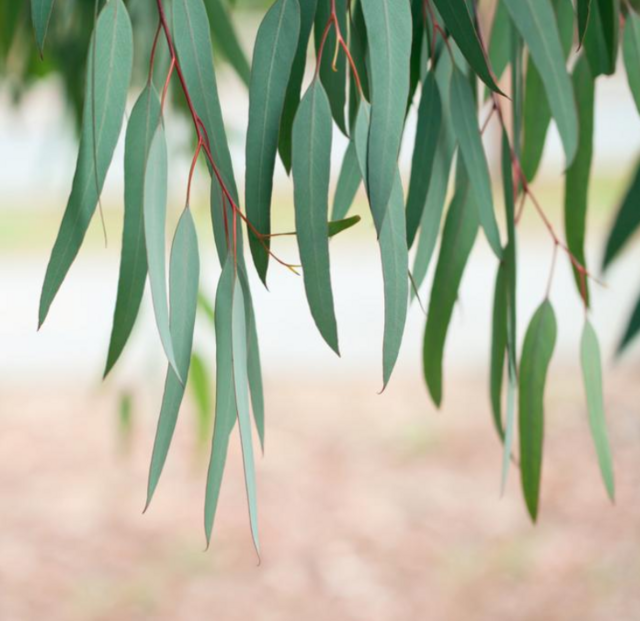 Eucalyptus oil is extracted from the fresh or partially dried leaves and young twigs. The main chemical components of eucalyptus oil are a-pinene, b-pinene, a-phellandrene, 1,8-cineole, limonene, terpinen-4-ol, aromadendrene, epiglobulol, piperitone and globulol. The therapeutic properties of eucalyptus oil are analgesic, anti-bacterial, anti-inflammatory, anti-neuralgic, anti-rheumatic, antiseptic, antispasmodic, antiviral, astringent, balsamic, cicatrisant, decongestant, deodorant, depurative, diuretic, expectorant, febrifuge, hypoglycaemic, and stimulant. Eucalyptus oil has a cooling and deodorizing effect on the body, helping with fevers, migraine and malaria. For the respiratory tract, it helps with coughs, asthma, throat infections, sinusitis and catarrhal conditions. It soothes inflammation and eases mucus, clearing the head from the stuffiness of colds and hay fever. Eucalyptus oil is useful as a warming oil when used for muscular aches and pains, rheumatoid arthritis, sprains and poor circulation. In skin care it can be used for burns, blisters, herpes, cuts, wounds, skin infections and insect bites. It can furthermore boost the immune system and is helpful in cases of chicken pox, colds, flu and measles. Eucalyptus oil is very helpful when used for headaches, fevers, ailments of the respiratory tract, muscular aches and pains and in skin care. It has a soothing and calming effect on the whole body and helps with the immune system. The oil is also effective against bacteria - especially staphylococci, and has a refreshing and stimulating action on the mind, helping to improve concentration. Eucalyptus oil can be used in a blended Massage Oil to assist with arthritis, asthma, bronchitis, mucous congestion, colds, headaches, rheumatism, sinusitis, catarrh, fatigue and muscular aches and pains. In an Organic Aromatherapy Body Lotion, apart from giving pain relief to muscular spasms and rheumatism, eucalyptus can also help speed up the healing of slow healing wounds and ulcers, calm skin eruptions and clear congested skin.